Another Long Walk: Day 33: Huge day! HUGE! September 26: Overnight temperatures were expected to fall into the teens--about the same as the night before, but this morning felt infinitely warmer! Not being deep in a canyon that cold air sinks into or camping directly on and around snow made a huge difference. It was still cold, though. Definitely below freezing--probably in the teens, in fact--but mentally it felt so much warmer than yesterday and I had a lot easier time getting up and out of my sleeping bag and hit the trail by around 7:30. A little later than usual, but not too bad! 'Tis a beautiful morning for a hike! 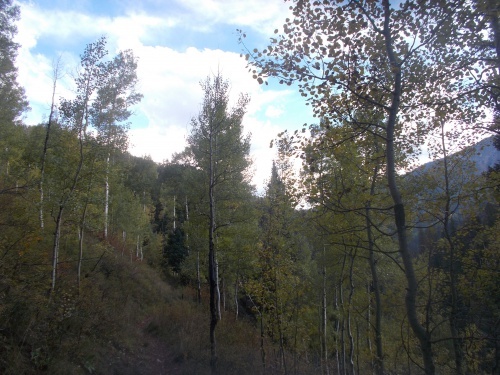 Somewhat surprisingly, I was able to get a cell phone signal from camp--the first time I'd been able to get a signal from the trail in about two weeks just before my arrival into Salida. But it let me get an updated weather forecast which predicted snow at higher elevations late in the afternoon. 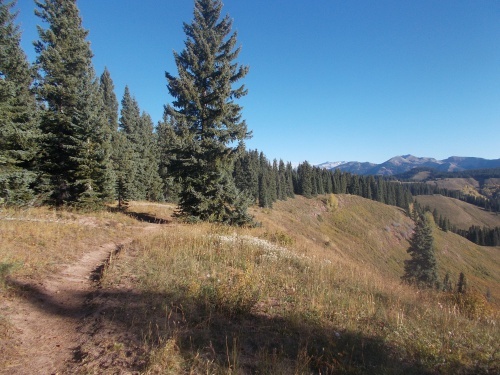 The trail would bounce around at around 11,000 feet most of the morning, then climb over a series of five 12,000-foot mountains before plummeting towards its end in Durango. 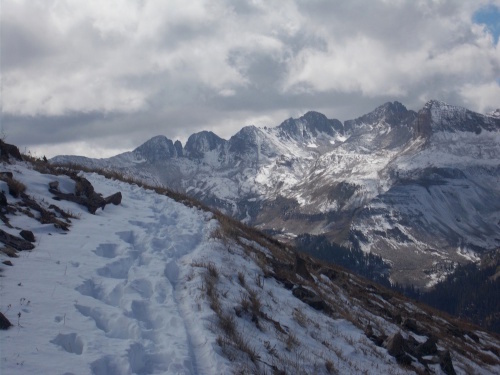 My goal was get over those 12,000-foot passes before the snow struck. The trail was basically all downhill from that point, and I figured the lower in elevation I could get the better. The snow was expected to fall all night and all day the next day. 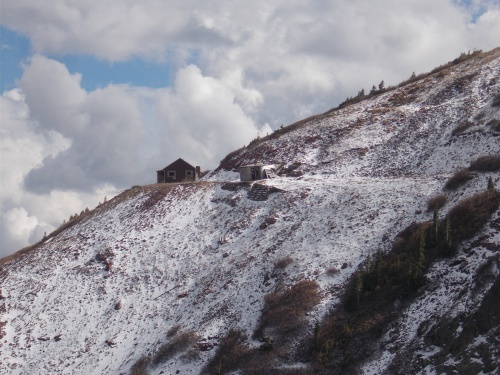 Silverton was expected to get several inches of snow. 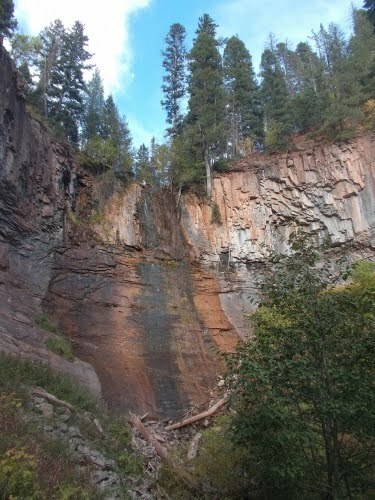 Durango, at a much lower elevation, was only expected to get rain. Lots and lots of miserable rain. Temperatures, fortunately, were expected to be much warmer--nearly 20 degrees warmer than the last couple of nights. Clouds trapping in the day's heat tends to do that. 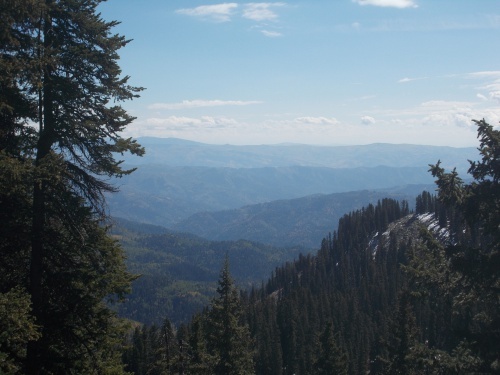 And if I could reach Junction Creek, I'd be camped at a relatively low 8,540 feet above sea level. 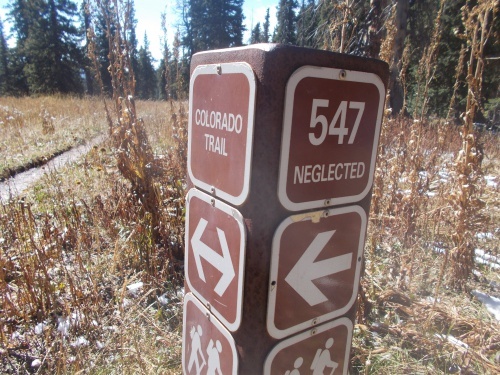 That might not seem low, but the trail hadn't been this low since Mount Princeton Hot Springs Resort more than 200 miles earlier. The weather forecast hadn't changed much since I left Silverton. Basically, today was my last day of decent weather. There was no way I could finish the trail today, but I hoped to camp low. 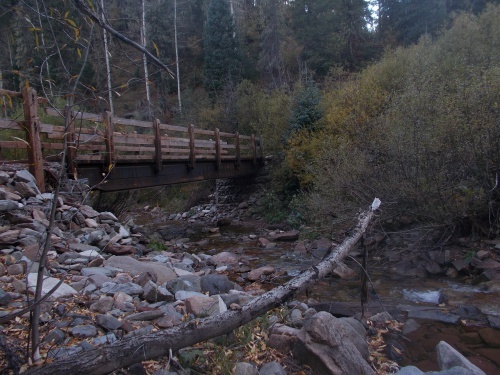 Hopefully I'd make it to camp--my goal was Junction Creek almost 23 miles away. 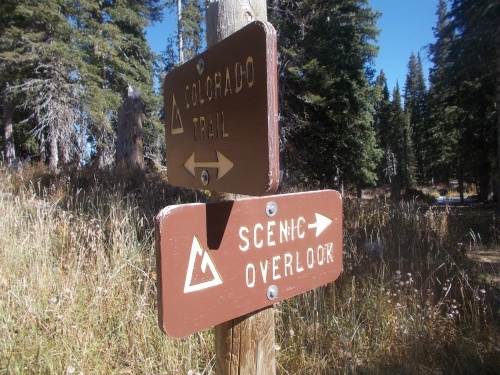 I wasn't sure that I would make it, but even if I could only make it 20 miles, it would still get me over the highest peaks and under 10,000 feet. Hopefully low enough that I wouldn't find myself postholing through difficult snow tomorrow morning. Tomorrow would be miserable, though. 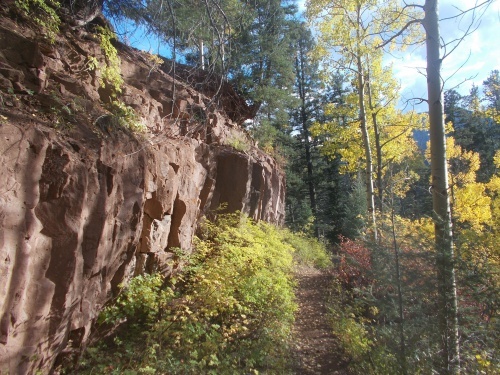 I'd wake up to rain (or snow), and hike it in all day to the trail's end. 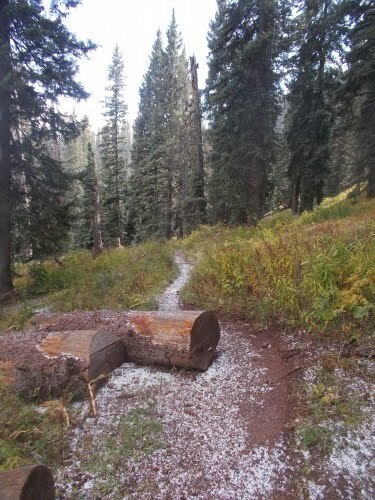 If I woke up to snow, it would probably turn to rain at some point during the day as the trail dropped in elevation. So the more miles I could do today, the fewer awful miles I'd have to do tomorrow. Today was going to be all about miles. Minimal breaks, hike hard, and get as far as I could before dark. I passed the Four Mousketeers (the group's name kept evolving in my head--first it was "Mouse and friends," then it was the "Mousketeers," and now I was calling them the "Four Mousketeers"). They were still breaking down camp perhaps 15 minutes up the trail from where I camped. I stopped and chatted for maybe half a minute while we discussed the weather prospects, but then I pushed on. I had miles to do! 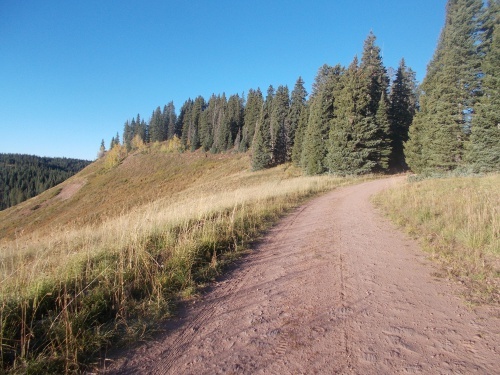 When I passed by the Grindstone Trail, my pace slowed considerably. 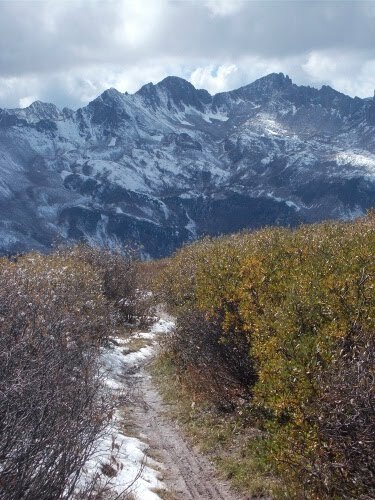 The trail became much more rugged passing over a series of five 12,000-or-so-foot snow-capped peaks. It was cold, windy and steep. Dark clouds obscured the sun making the wind-driven cold even worse. 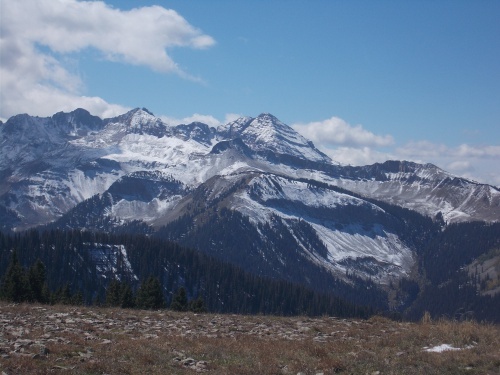 I was surprised by the amount of snow I had to often posthole through on those peaks. Most of the snow from the storm several days earlier had melted already, but not at these lofty and exposed peaks. Some of the snow drifts I had to plow through where a foot deep. Not horrible, but certainly not easy either! I counted each mountain top as I went over. One down, four to go. Two down, three to go. Come on, Ryan! I thought. Three more humps and it's all downhill from there! I took short breaks in the valleys between the humps since the mountains seemed to act like wind blocks, but I never stopped for more than about 5 or 10 minutes before resuming. I had miles to do! Every mile I finished now was one less mile I'd have to hike in rain tomorrow! I pushed myself like I had never pushed myself before. Occasionally I'd look back for the Four Mousketeers--the views were phenomenal from those mountaintops and I could often see the trail for miles ahead and behind me--but I never caught sight of them. I figured they couldn't be too far back, though, since I knew they planned to finish the trail tomorrow as well. This is one of the most interesting icicles I had ever seen! 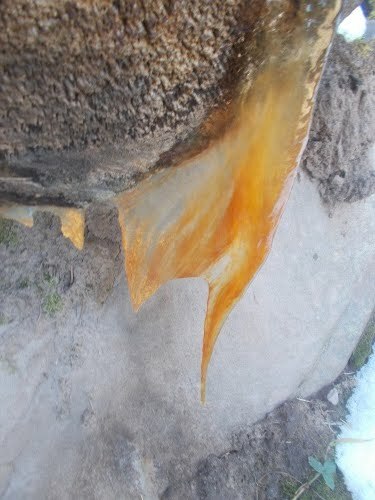 Sap from the tree mixed in with the ice giving it this interesting color! After the last of the 12,000-foot peaks, the trail plummeted down a steep slope towards Taylor Lake which was steep enough that I couldn't get down that very quickly either. At a creek near the lake, I filled up with water again--it was the first place I could fill up with water today. The last place I got water was Straight Creek--yesterday and nearly 20 miles back. 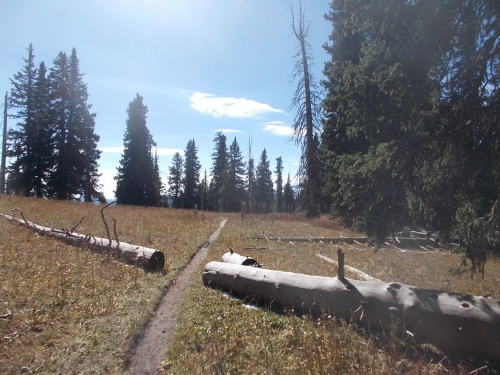 The trail leveled out for a couple of miles until Kennebec Pass from which I could see the cabin marked on my map that I considered staying in. It hadn't started snowing or raining yet, however, and I still had a couple of hours of daylight left and decided to keep going. A part of me wanted to go off trail the short way to the cabin and check it out, but I didn't have time for that. I needed to get miles in while it was still light. The side trip to the scenic overlook was enough side trips for the day. 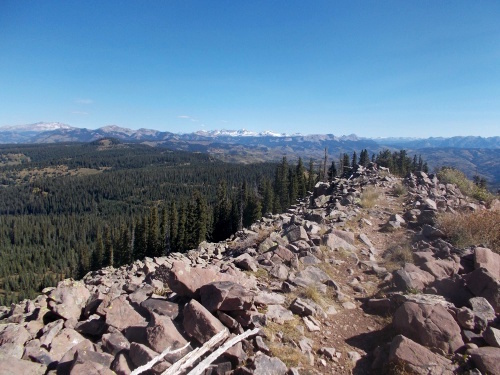 From Kennebec Pass, the trail plummeted again, dropping about 3,000 feet to my goal at Junction Creek. While most of the day had been above tree line, I now descended into a thick forest of trees which gave me a certain degree of relief. At least if I had to stop at any point, I wouldn't be exposed. 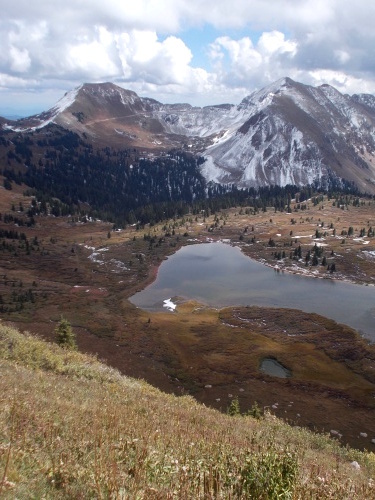 Just below Kennebec Pass, I heard the first echo of thunder rolling through the mountains. I could see rain in the distance. Crap! It looked like I wouldn't reach my goal before the storm struck. 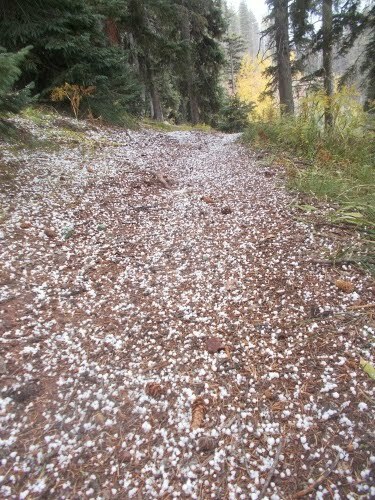 Ten minutes later, a hail storm struck. Or more like a hail/graupel storm. The rain on the horizon looked patchy and I hoped it would sweep by and give me more time to make it further down the trail unaccosted. The hail lasted for about 5 minutes and then for an hour, the skies actually cleared up! A little bit of hail/graupel just to keep things interesting! I pushed on down the mountain slopes, now making excellent time again. Not too steep to slow me down. I arrived at my destination at 6:15 a little surprised that I made it there so early. My intention had been to hopefully reach this point by 7:00 and if I didn't make it by 7:00, quit at the first decent place I could find at around 7:00. I still had 45 minutes of hiking I could do before dark! My guidebook showed another campsite about a mile further down the trail. 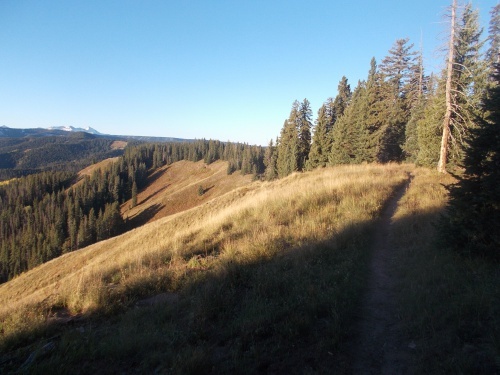 I had picked this destination as my goal because it was the low point of the trail before it climbed one last mountain (just a 1,000-foot climb) before the non-stop drop to Durango. From here, the trail went back up a bit, which might make it colder during the night. Higher elevations are usually colder, after all. 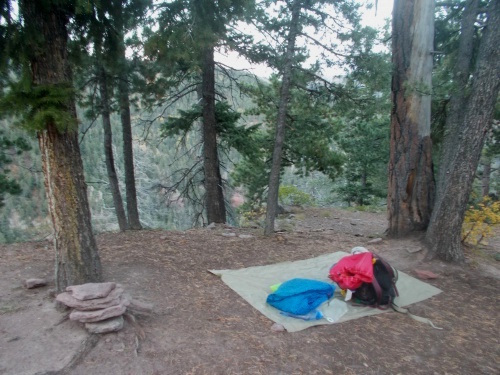 But this campsite was deep in a canyon with a cold river running through it. The campsite a mile ahead was on the lip of the canyon with no water around it at all. I figured it might be a couple of degrees colder due to the higher elevation, but it would likely be an order of magnitudes warmer since I wouldn't be in a canyon that trapped a lot of cold air. And one more mile today meant one less mile tomorrow in miserable weather. I set up my tarp next to the edge of a steep cliff. Okay, maybe five feet away from the edge of a cliff. As long as I don't sleep walk during the night I'll be fine. 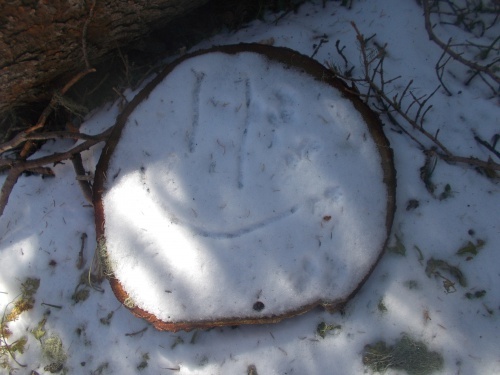 =) I didn't really expect it to snow--I figured I had dropped low enough in elevation that snow seemed unlikely at this point--but it was definitely going to rain during the night and I wanted to be prepared! Temperatures were considerably warmer tonight. I still curled up in my sleeping bag, but this time I felt warm enough to leave my arms out to handle my Kindle while reading deep into the night. 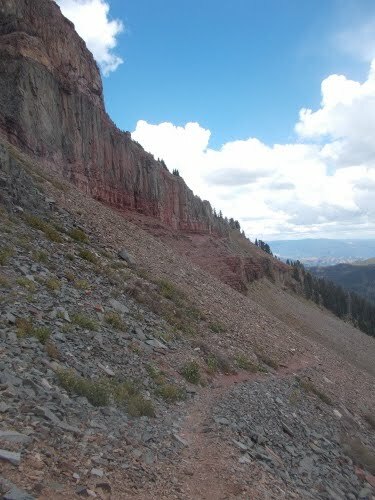 And, if all went well, tomorrow I would be finishing this trail. It would be a miserable, wet walk--but I had barely 13 miles left, and it was all downhill on a gentle path. I probably wouldn't finish before noon, but an early afternoon finish seemed assured. How could I walk by without checking out an official "scenic overlook"? It was off-trail, but I couldn't resist! 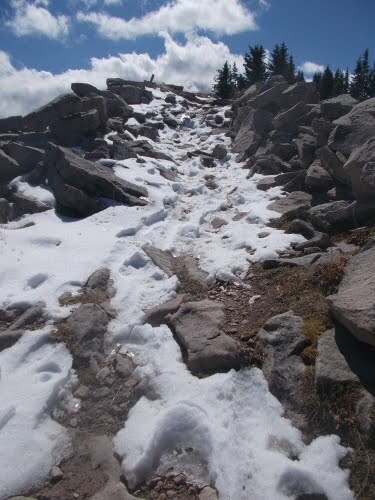 The series of five snow-covered 12,000 foot humps were steep and slowed me down considerably! Coming down from the last of the 12,000-foot peaks with Taylor Lake below (and the first water on the trail for 20 miles). The cabin that I thought maybe I could sleep in if I had to--but I didn't have to!